vSpace Server software divides a computer’s resources into independent virtual workspaces that give each user their own rich PC experience. Space Server interacts with the NComputing UXP (User eXtension Protocol) and the NComputing thin clients and software access clients to deliver a highly optimized end-to-end desktop virtualization solution. 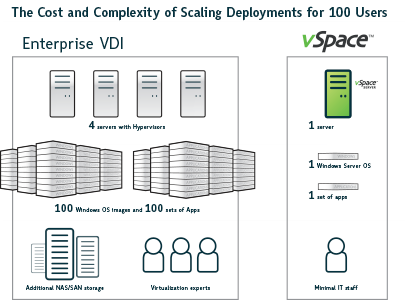 For remote management of NComputing thin clients, vSpace Management Center provides a flexible, web-based management tool for all network-connected thin client devices connected to vSpace Server 7.0 and up.